Since Prog readers voted Synaesthesia as the band to watch in 2014, and following the release of their eponymous debut album, they have undergone quite a transformation. There has been a name change to Kyros, a departure from their record label, a decision to self-manage and a new guitarist to embrace into their sound. Seemingly, the band’s frontman and original leader Adam Warne has been a rather busy chap. The band’s new album, Vox Humana, ably showcases that musical variety and dexterity. 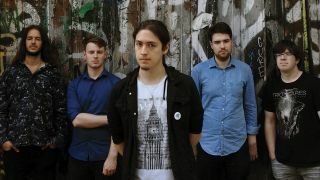 There are flashes of neo-prog and progressive metal, and Kyros have even involved Haken drummer Raymond Hearne, who arranged a brass section for some of the tracks. Superficially at least, such potentially conflicting influences could result in an unruly amalgam of combating sound, but the band have taken over five years to ensure that the final album embraces all those approaches so there’s a cohesive and endearing form. Unlike many bands who struggle for years to complete an album, the sheer wealth of material gathered during the writing phase ensured that Vox Humana would eventually extend over two discs. The concept to which Warne refers is a futuristic tale that Coheed And Cambria would be rightfully proud of. The lyrics recount the tale of a social outcast who decides to relocate to the wilderness in order to build a flawless robotic companion. At times, it’s a multilayered story and Warne attempts to provide a neat summary of the plot. “Basically, this guy grows up quite obsessed with technology and he has never fitted into society and that’s where the first few songs on the first disc come from,” he says. “He’s someone who spent time alone in his room playing videogames and experimenting by building things. He eventually grows up still not being able to relate to society, so he leaves the city with a backpack with all his belongings, runs away from home and finds a shack in the middle of a field. He thinks he wants to build what he feels would be the perfect companion as he had never had anyone who he felt was a true friend. With such a dominant concept and a musical backdrop that’s equally powerful, Kyros could easily make a breakthrough with this album. It’s therefore somewhat surprising that the band have opted to leave the GEP label in order to self-release the album, and have also taken the bold decision to manage themselves. Yet speaking to Warne, even if he doesn’t ever express it, there’s clearly an inner confidence that the band are just as capable of looking after the business aspect as they are at creating lush music. You also suspect that they’re fully aware of the album’s strength and potential, and that they see traditional record labels as being endangered entities. “There were a few creative differences with GEP, so unfortunately we had to leave them with the greatest regret,” he reveals. “It was an amicable split and there was no bad blood but there was a differing of creative approaches and we were constantly hitting a brick wall, so we decided it was simpler to part ways. We’ve set up our own label and for all the work that has gone into the new album, it has been a matter of taking care of the business side. But it has allowed us to make some controversial decisions with the music and we believe the end result is much better. It’s a lot of work managing ourselves, but we have a hell of a lot more freedom and we can do what we want in terms of how to allocate time and budget. Vox Humana is out now on KMG. For more information, visit www.kyrosmusic.com.